Australia car rental market has been rapidly growing on the back of high tourist flows, growth of free independent travelers and huge opportunities in cab sharing services. Moreover, growing importance of IT platforms, increasing number of players in car rental and sharing industry, and growth of inbound arrivals will majorly account for the growth of Australia car rental market over the forecasts period. According to Goldstein Research, in past few years more than 20% of Australians used a rental car for business or leisure purpose which is the key factor for the growth of Australia car rental market. Goldstein Research analyst forecast Australia car rental market to expand at a CAGR of 4.6% during the forecast period 2017-2025. Further, the market is anticipated to reach USD 1.8 billion by the end of forecast period. The report covers the present ground scenario and the future growth prospects of the car rental market for 2017-2025 along with the total revenue of car rental in every region. We calculated the market size and revenue share on the basis of revenue generated from the car rental services to individual customers and commercial users across the Australia. The revenue forecast is given on the basis of number of car rental service providers and current growth rate of the market. Based on mode of bookings, it is projected that online booking channel for car rental services will account for around 85% of the total transaction value by 2025. 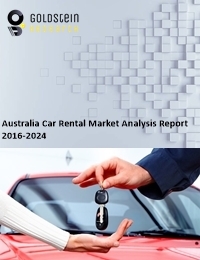 Australia Car Rental Market Outlook 2017-2025, has been prepared based on an in-depth market analysis from industry experts. The report covers the competitive landscape and current position of major players in the Australia market. The report also includes porter’s five force model, SWOT analysis, company profiling, business strategies of market players and their business models. Australia market report also recognizes value chain analysis to understand the cost differentiation to provide competitive advantage to the existing and new entry players. Our Australia market report comprises of the following companies as the key players in the Australia car rental market: Avis Australia Car Rentals, Hertz Investment (Holdings) Pty Limited, Europcar Asia Pacific, Tourism Holdings Ltd, Uber, GoCatch, Ingogo, GoGet, Flexicar and GreenShareCar. According to our Australia market study on the basis of extensive primary and secondary research, one major driver in the market is growing tourist flows into Australia, particularly from Asia, are set to be the key factor of growth. Moreover, Australian government has endorsed an aggressive tourism target as part of the Tourism 2020 strategy, which will further propel the growth of car rental market in Australia. The car rental industry in Australia serves more than 400,000 international customers and purchases up to 40,000 new vehicles every year. Further, the report states that one challenge in car rental market is inconsistent and insufficient regulatory frameworks. The car rental industry abides by eight different state and territory regulatory and tax regimes. Of these authorities, only Tasmania has guideline specifically designed for the rental car industry.